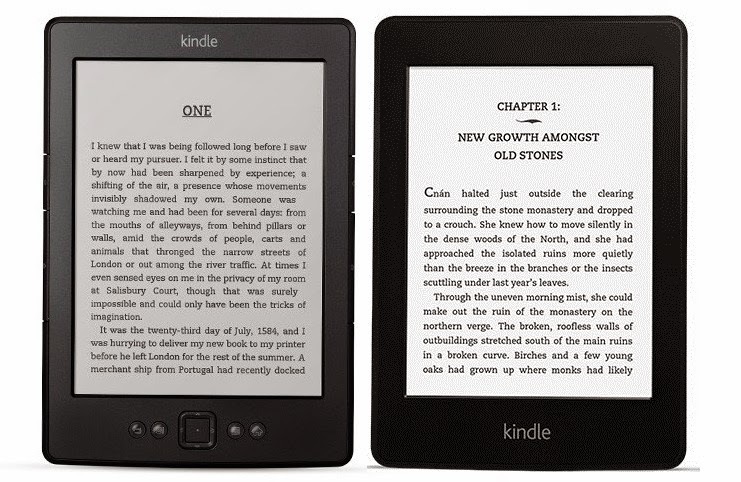 Kindle or Kindle Paper White? Compare both to find which one is better! No doubt, Kindle is indeed an excellent dedicated e-reader that will change your reading experience for good. How does it compared with the latest ‘Kindle Paperwhite’? What are the pros and cons when we compare basic Kindle Vs Kindle Paperwhite? That is something that i am trying to address through this post. You will pay more for Kindle Paperwhite as it offers more features than the basic kindle. However, understand that more features doesn’t necessarily mean better device. It is more importantly about your requirements. 6.5" x 4.5" x 0.34"
Kindle, also known as ‘basic Kindle’ is small, light and extremely portable. It’s an ideal device for reading tons of books without worrying about eyestrain or battery life. The 5-way controller is rather user friendly and easy to navigate or turn pages. The absence of buttons to turn pages on Paperwhite is often criticized by users. This is because with your fingers sweating you can easily dirty the display in the process of turning pages or navigating. Kindle is overall a good value. It is the cheapest version of kindle and would work just fine at night with a reading light that would cost less than 5000 INR. There are no major negative remarks for basic Kindle but there are things which are not so good as compared to Kindle Paperwhite. First, the lack of physical keyboard or touch-screen can be a pain when you take notes or type. The virtual keyboard that you access from the 5-way controller is terrible for typing. Secondly, it is the battery life. It is not as good as the Paperwhite. In fact, it can offer only up to 4 weeks with the wireless off which is half the battery life span of Paperwhite. The best thing about Kindle Paperwhite is its display technology including E Ink (4th generation) along with patented built-in light. The display consists of three layers to deliver a comfortable and amazing reading experience. The fist layer is the E Ink display that features 768×1024 resolution with 221 PPI (pixels per inch). This is compared to 600×800 resolution with 167 PPI of Kindle. 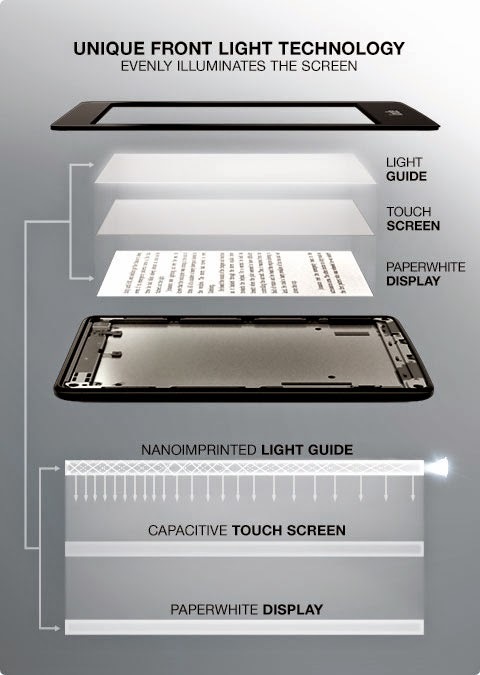 The second layer is the capacitive Touch screen. The third layer which is the outer layer is the nano-imprinted light guide. The lighting is beautifully done to get perfectly balanced whiteness. It’s a small low-power LED lights that’s projected over the cover, so that you can read at dark with no eye strain or sun glare. It’s not uneven like the ‘reading light’ that we use on Kindle that doesn’t self illuminate. You can customize the light with 24 different levels but you can’t turn it off. The Paperwhite turn pages faster than Kindle. Also, Paperwhite support X-Ray feature that allow readers to track a book’s character or certain common information. With Paperwhite you have the option of 3G+Wi-Fi and Wi-Fi only version. Kindle comes with Wi-Fi connectivity only. Paper white will cost around 10K INR. Compared to kindle, Paperwhite is priced higher. But, my take is it is worth. Although there are complaints that while holding Paperwhite, I’d often touch the screen accidentally and turn pages. This is because I don’t always sit upright while reading from Paperwhite. But, once get used to the orientation its not a problem at all. If budget is not a constraint, Kindle Paper White is the way to go. Note: Pricing may change from what i have mentioned above. Please visit www.amazon.in for the latest pricing.